The Hard Way with Joan Leslie and Ida Lupino. On Tuesday, Aug. 8, at 7:30 p.m., the American Cinematheque in Hollywood will honor director Vincent Sherman, who died this past June 18, with a screening of the 1943 Warner Bros. movie The Hard Way. A hard-hitting melodrama, The Hard Way follows two sisters, played by Warner contractees Ida Lupino and Joan Leslie, along their rough path to professional success and personal ruin. Ida Lupino won the New York Film Critics Circle's Best Actress Award for her performance as the ambitious “stage sister”; but in my view, the film belongs to steely “ingénue” Joan Leslie – a talented actress who was mostly wasted by the Hollywood studio system. Besides Lupino and Leslie, The Hard Way also features Jack Carson, Dennis Morgan, Gladys George, Faye Emerson, and Paul Cavanagh. The screenplay is credited to Daniel Fuchs and Peter Viertel (The African Queen, The Sun Also Rises – and Deborah Kerr's husband since 1960). The screening of The Hard Way will be preceded by “rare interview clips” with director Vincent Sherman, whose credits include the Bette Davis / Miriam Hopkins pairing Old Acquaintance (1943), the Bette Davis / Claude Rains pairing Mr. Skeffington (1944), and the Richard Todd / Patricia Neal pairing The Hasty Heart (1949). Note: The Ida Lupino / Joan Leslie The Hard Way movie has absolutely nothing in common with the John Badham-directed The Hard Way, a 1991 action comedy starring Michael J. Fox, Stephen Lang, Annabella Sciorra, and James Woods. Also of note, between July 5–9, 2006, the American Cinematheque's Aero Theatre in Santa Monica will screen a series of cult/classic comedies, among them Stanley Kubrick's still (and unfortunately) quite relevant military satire Dr. Strangelove (Wednesday, July 5, at 7:30 p.m.), and two Frank Capra classics, Arsenic and Old Lace and You Can't Take It with You (Sunday, July 9 - 7:30 p.m.). The former, filmed in 1941 but released in 1944, is too stagy and is marred by Cary Grant's overripe performance; the supporting cast, however, is superb, including Raymond Massey (doing a spot-on Boris Karloff imitation), Peter Lorre, Jean Adair, Josephine Hull, and Priscilla Lane. The latter movie belongs to the Capra-Corn School of Filmmaking, but it has some pretty funny moments, and apart from an actorish James Stewart, the madcap cast – Jean Arthur, Mary Forbes, Ann Miller, Spring Byington, etc. – shines. Press Release: Beverly Hills, CA – The 1970 Best Picture nominee Airport will be screened as the next feature in the Academy of Motion Picture Arts and Sciences' “Great To Be Nominated” series. Based on the novel by Arthur Hailey, the film will be shown on Monday, July 17, at 7:30 p.m. in the Academy's Samuel Goldwyn Theater. Actress Jacqueline Bisset and castmates Damian London and Quinn K. Redeker, along with the film's publicist, Robert Werden, will participate in a panel discussion following the screening. In Airport, Burt Lancaster stars as Mel Bakersfeld, manager of Lincoln International Airport, who is struggling to keep his facility open despite a severe snowstorm, complaints from angry nearby homeowners and his own personal problems. Airport received a total of 10 Academy Award® nominations, including two nominations in the Actress in a Supporting Role category. Helen Hayes ultimately took home the Oscar® for her performance as Ada Quonsett, beating out castmate Maureen Stapleton, nominated for her performance as Inez Guerrero. The film also was nominated for Best Picture (Ross Hunter, producer), Art Direction (Alexander Golitzen, E. Preston Ames; Set Decoration: Jack D. Moore, Mickey S. Michaels), Cinematography (Ernest Laszlo), Costume Design (Edith Head), Film Editing (Stuart Gilmore), Music – Original Score (Alfred Newman), Sound (Ronald Pierce, David Moriarty) and Writing – Screenplay based on material from another medium (George Seaton). Oscar-nominated animated short The Further Adventures of Uncle Sam: Part Two (1970) will be shown prior to the screening. Passes for “Great To Be Nominated” are still available at a cost of $30 for film buffs wishing to see the rest of the series. A $5 discount is available for those who wish to renew their passes from Parts One and/or Two of the series. Inclusive of Airport there are 7 screening dates remaining in Part Three. Tickets for each individual screening may be purchased at a cost of $5 for the general public and $3 for Academy members and students with a valid ID. Tickets may be purchased by mail, in person at the Academy during regular business hours or, depending on availability, on the night of the screening when the doors open at 6:30 p.m. Curtain time for all features is 7:30 p.m., and pre-show elements will begin at 7 p.m. The Academy is located at 8949 Wilshire Boulevard in Beverly Hills. For more information, call (310) 247-3600. Note: This is the restored, original 170-minute version of The Diary of Anne Frank. Press Release: A Look Inside the Diary of Anne Frank – New York, NY – One of the first mainstream films to deal directly with the Holocaust, The Diary of Anne Frank (1959) will unspool for “Monday Nights with Oscar®” audiences on Monday, July 17, at 6:30 p.m. (earlier time) at the Academy Theater at Lighthouse International in New York City. Presented under the banner of the Academy's George Stevens Lecture, the event will feature a post-screening discussion with cast members Millie Perkins (Anne Frank), Diane Baker (Margot Frank) and Richard Beymer (Peter Van Daan). Robert Osborne, Hollywood Reporter columnist, host of Turner Classic Movies and official biographer of the Academy Awards®, will moderate the program. The Diary of Anne Frank was directed and produced by two-time Academy Award® winner George Stevens, and it was adapted by Frances Goodrich and Albert Hackett from their 1955 Pulitzer Prize-winning play of the same name (which was in turn based on Anne Frank's diaries, published in Anne Frank: The Diary of a Young Girl). The black-and-white film tells the story of 13-year-old Anne's life in hiding in Nazi-occupied Holland. The Diary of Anne Frank was nominated for eight Academy Awards and won in three categories: Actress in a Supporting Role (Shelley Winters), Black-and-White Art Direction (Lyle R. Wheeler, George W. Davis; Set Decoration: Walter M. Scott, Stuart A. Reiss) and Black-and-White Cinematography (William C. Mellor). In addition to the nominations Stevens earned as the film's producer and director, Ed Wynn received a nomination in the Supporting Actor category, Alfred Newman was nominated for the film's music score, and Charles LeMaire and Mary Wills shared the nomination for Black-and-White Costume Design. This New York screening of The Diary of Anne Frank will be the first big-screen presentation of a newly restored print of the original 170-minute version (the film was shortened by 20 minutes soon after its initial release). The print is courtesy of 20th Century Fox. The George Stevens Lecture was established in 1982 in honor of the legendary producer-director whose films are best remembered for combining social conscience with artistic excellence. Stevens received nine Academy Award nominations, won directing Oscars for A Place in the Sun and Giant, and was awarded the Irving G. Thalberg Memorial Award in 1953. He was a longtime member of the Academy's Board of Governors and served as the organization's 14th president. Stevens died in 1975. The Academy Theater at Lighthouse International is located at 111 East 59th Street in New York City. Tickets for the screening are $5 for the general public and $3 for Academy members and students with a valid ID. Tickets may be reserved by calling 1-888-778-7575. Depending on availability, tickets may be purchased in person the night of the screening. 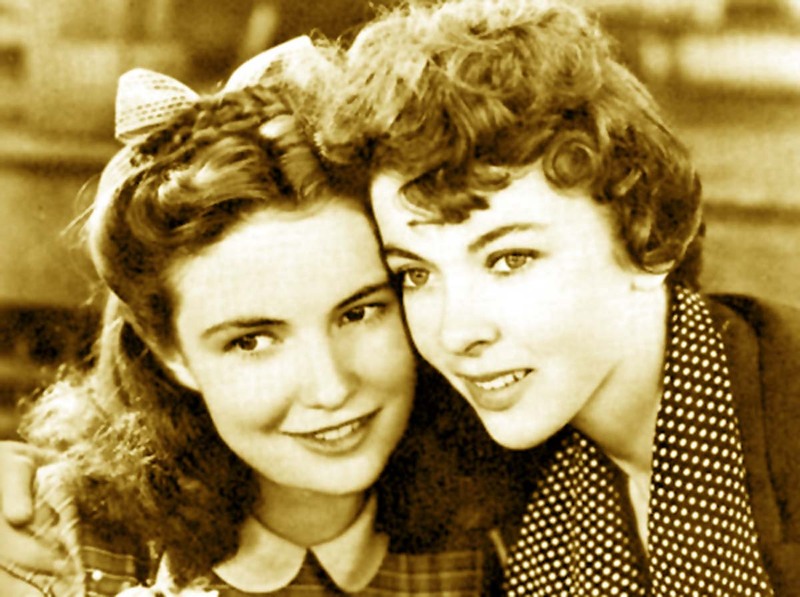 Doors open at 6 p.m.
Joan Leslie and Ida Lupino in The Hard Way movie photo: Warner Bros.
Hey! I truely believe Anne was a very brave, young girl. She and her diary made an influence on my life. Before I read her journal, I was a very judgmental person… But now I can see that I have changed from the inside out. Thanks Anne! May God bless your soul. I think that i am in LOVE with her. I'm still reading her diary and i think that we have some connections from generations. If I get anytime Harry and Peter then I'll positively kill them. i LOVE Anne Frank she was and amazing person i am reading her diary right now! i cant wait till i get to go to heaven to meet her! Very nice!! as a filipino 3rd year high school student.. i'm very proud to anne frank because of her bravery that she showed. By writing in a diary she choose this to write all the informations or the feelings that she expiriencing about the day comes… So sad..that Anne Frank died because of typhus and if you don't mind she's beautiful huh!! Thanks Anne Frank! Because of you lots of people inspires of your bravery!! MwaaaHH!!! I like “The Hard Way” very much, I think it is almost the first dramatic role Jack Carson had, and he is excellent in it. I have built a website about him as I think he is been almost forgotten in recent years, and it's about time he was given a second look.